Abstract: The MSI MEGA mPC945 system is based around the Intel 945G and Intel ICH7 chipsets and is compatible with all Socket 775 Intel Pentium 4/D/XE, Celeron processors. 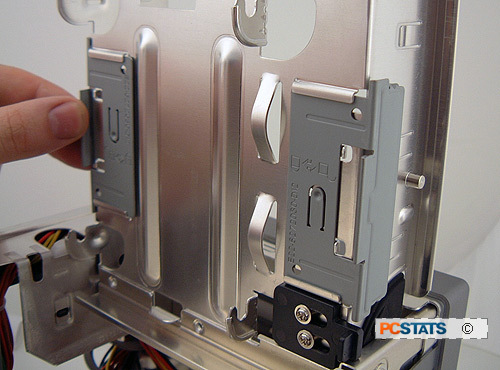 Taking off the glossy white aluminum cover of the MSI MEGA mPC 945 is as easy as removing three thumb screws. The screws are attached to the panel itself (captive screws) so there's no way they can get lost either. Once the one-piece aluminum shell is removed, you'll be greeted by the 5.25" drive cage. 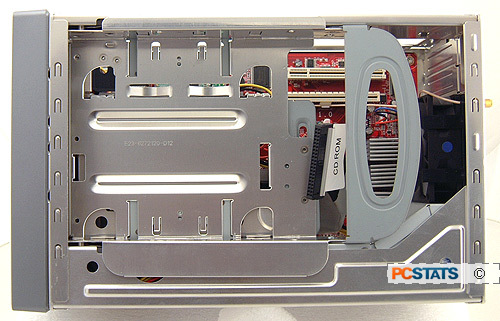 The top view illustrates how drive space and the power supply are arranged in the mPC 945 small form factor case. MSI has a few well placed cable clips to keep the general space clear and organized. The 260W power supply is set up along the side of the case, which makes good use of space and allows a large exhaust fan to be placed at the rear of the chassis. Both 5.25" and 3.5" drives are mounted to the tray with tool free clips, and indeed the handle at right allows easy access to them as the whole assembly flips up. MSI does its best to keep things simple and tool free. 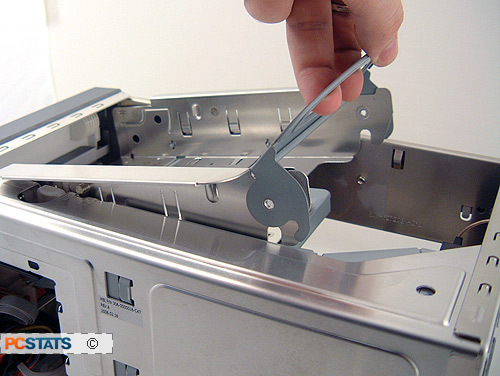 The aluminum drive bay caddy is removed by simply pulling up on the handle. Once it's at its highest position, pull out the little black lever to lock the cage in the upright position so you can begin working in the case. Pull up on the handle to release the drive caddy from the chassis. All the data and power cables are pre-routed to the rear edge of the 5.25" and 3.5" drive caddy. 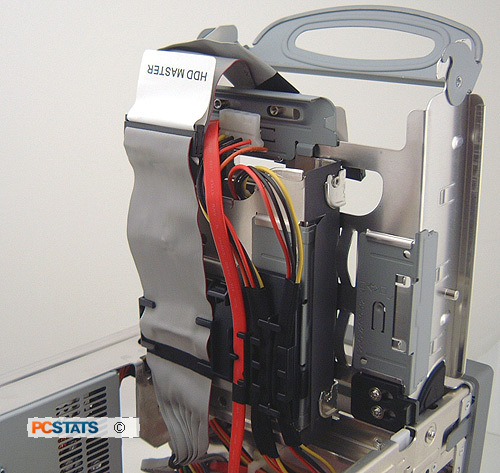 Drives are installed without tools, and are held in place with integrated clips. Pull up on the recessed white tab on either side of the drive caddy, and the entire assembly removes from the chassis (lower right). Pull the black tab out to lock the drive caddy in its upright position so you can work on the system without things coming crashing down. MSI recommends installing a flat bezel optical drive in the mPC 945 system. 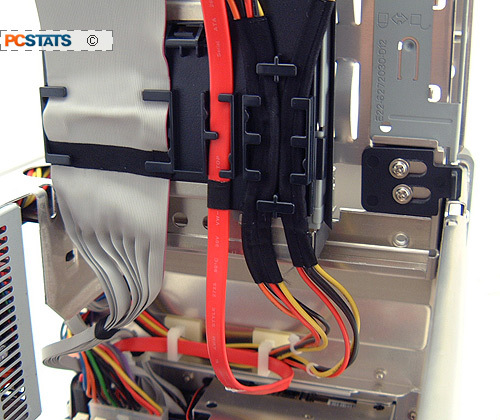 To install the 5.25" or 3.5" drives, you'll first need remove the black plastic cable organizer. Pull up the white tabs on the chassis's frame and the entire aluminum cage will come free as well. These tabs are used to lock the optical drive in place once it is installed. Similar clips on the underside of the hard drive caddy keep the Mega mPC 945 small formfactor system surprisingly tool free to work with. Once the cable organizer has been removed you can slide the CDROM in and engage the locks that hold it in place - it's nice not to have to use screws. Slide the hard drive lock to the release position and pop drive cage off. Undo the HDD locks and the drive slides right in. Installing or removing the optical drive works the same way.